You've had some time now to get used to the new addition to your family. Your baby should be eating every three to four hours and growing nicely. You do not need to worry about adding water or anything else to his or her diet of formula or breast milk. For now, these provide all of the nutrients a baby needs. Make sure you stay healthy too. Continue eating right and getting enough rest. Your baby's schedule might very well have days and nights backwards right now. Some babies at this age have problems with constipation. Remember, there is no correct number of bowel movements. What's most important isn't the frequency, but that the consistency of the stool is normal and bowel movements aren't painful. Colic or increased fussiness might also begin at any time. If you are concerned about increased crying or fussiness, let your child's doctor know. The doctor might have helpful suggestions. Make sure smoke detectors are installed and functioning. Test them once a month. Always use a car safety seat properly. Make sure you have purchased a car seat that is the right size for an infant (under 20 pounds). Read the instructions carefully and make sure that the seat is properly installed in the back seat of the car. Never leave a baby unattended or alone with siblings or pets. Never put a necklace, pacifier or toy around the baby's neck. Bars on cribs should be no more than 233/8 inches apart. Avoid hanging ribbons or ties from the crib. 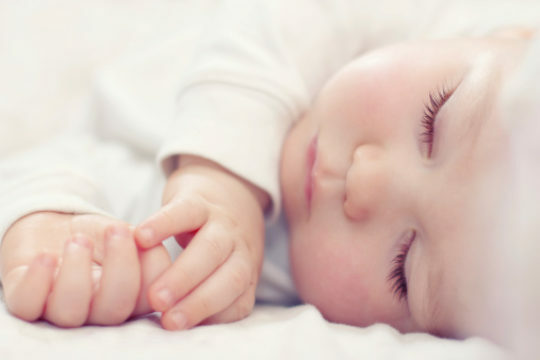 Don’t allow a width of more than two adult fingers between the crib mattress and frame.